Upper Noe has an acting class for children ages 6 to 10? The Camp Mather lottery opens January 7 and closes February 8. The popular High Sierra camp, operated by the Recreation and Parks Department, offers eleven one-week sessions running June 1 to the week of August 10. Applicants have the option to rank in order of preference up to three possible weeks, and San Francisco residents are given priority. Rental contracts will be mailed in early March. You can read more details about the camp in last year’s February FNVRC newsletter. Sign up here for the Camp Mather newsletter. 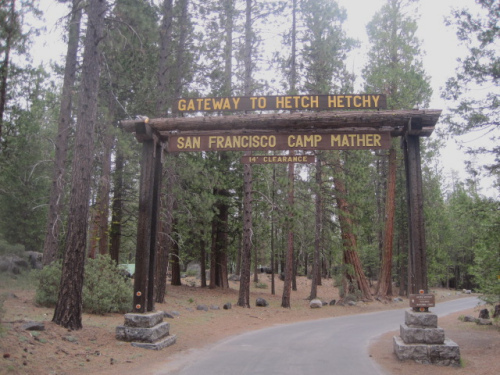 For more information, visit http://sfrecpark.org/destination/camp-mather. A few classes at Upper Noe still need participants to remain viable, says Facility Coordinator Cheryl Woltjen. All tennis classes, Friday’s theater class for children ages 6 to 10, Friday’s combat athletics for children ages 11 to 13, and Tuesday indoor soccer for 9 to 13-year-olds are all wide open. See the list of classes (listed by day and including descriptions) on our website. You can register for classes online at www.sfreconline.org, but you must have a "family account" to do so. Click here to create a family account. Please note: Saturday morning’s Bow Wow Baking class was left out of the catalog but does appear on our list. Drop in on a class for $10 or sign up for the whole term. Meet Ingleside Police Station’s new captain and grill MUNI officials at Upper Noe Neighbors January 9 meeting, which starts at 7:30 p.m. in the center’s auditorium. Captain Timothy Falvey will introduce himself, followed by a conversation with the MUNI Acting Deputy Director of Transit Services. She also hopes to have a J-Church driver present to talk first-hand about what it's like to drive the route. Later, a Sustainable Streets transportation planning manager will talk about the program’s progress. A division of the city’s Municipal Transportation Agency, Sustainable Streets designs, directs and manages all traffic engineering in San Francisco---pedestrian, bike, public transit and car. Facility Coordinator Cheryl Woltjen submitted a work order to fix the puddle that appears next to the sandbox in rainy weather. The problem will be examined shortly after New Year’s Day, she says. “Hopefully they’ll just have to drill a hole,” she says. Ladybug Gardeners will meet Saturday, January 12, so long as there is no rain, says lead Ladybug Joan Lionberger. This month volunteers will be weeding and laying down bark. Bring your gloves and trowel and meet at the center’s office at 9 a.m.
Children needing to log volunteer hours for school can earn them by digging in the dirt! For more information, email info@noevalleyreccenter.com. Applications for this summer’s Workreation Program are being accepted through January 18. The mentorship and training program for San Franciscan students ages 14-17 (or 18, as long as the student is still in high school) offers teens school-year and summer jobs in a variety of recreational, aquatic, horticultural, administrative, sports, afterschool and summer-camp positions. Participants earn minimum wage and develop leadership and problem-solving skills. Practical skills like safety awareness, program planning and first aid are also part of the program. Applications can be found online at http://jobaps.com/sf. 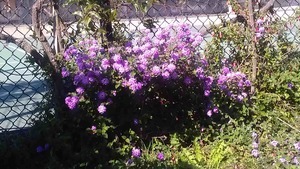 Scroll down and select Class 9910 Public Service Trainee for the SF Recreation and Park Department. A job application workshop will take place on Friday, January 4, at 10 a.m. at the Tenderloin Recreation Center, 570 Ellis Street, near Hyde. Interviews will take place mid-to-late February. Summer programming begins in June and ends in mid-August. For more information, contact Jennifer Gee at jennifer.gee@sfgov.org or 415-831-2785. Winners of the 2012 Community Opportunity Fund grant will be announced January 9, says Jake Gilchrist, a project manager for the Recreation and Parks Department. 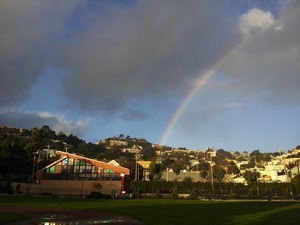 Cross your fingers for us: Friends of Noe Valley Recreation Center have applied for a grant to turn the neglected Sanchez Street side of the facility into an outdoor classroom. The weather cannot dampen these spirits. Though we've been inundated with heavy rains, the surface in Joby's Run is made of decomposed granite and drains well. 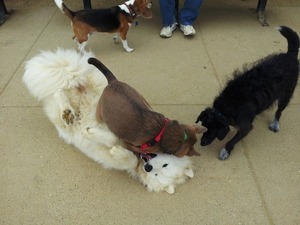 The play area is usually ready for more frolicking within minutes after a downpour. And since it contains no organic matter (mud), after it dries the gravel brushes right off. Rec & Park recently installed a filter with very small holes over the center drain to contain the gravel and keep the pipes clear. This also reduces the hazard to small dogs. The only drawback is that in heavy rains the filter tends to become clogged and form a puddle. Just grab a broom and give it a sweep to clear it. Play on! Agenda will include an introduction of the new Captain of Ingleside Station (Timothy Falvey) and a discussion with Muni on some issues affecting neighbors. Whack some weeds and dig in the dirt. Help turn the 24th Street parking lot at Sanchez into a town square.